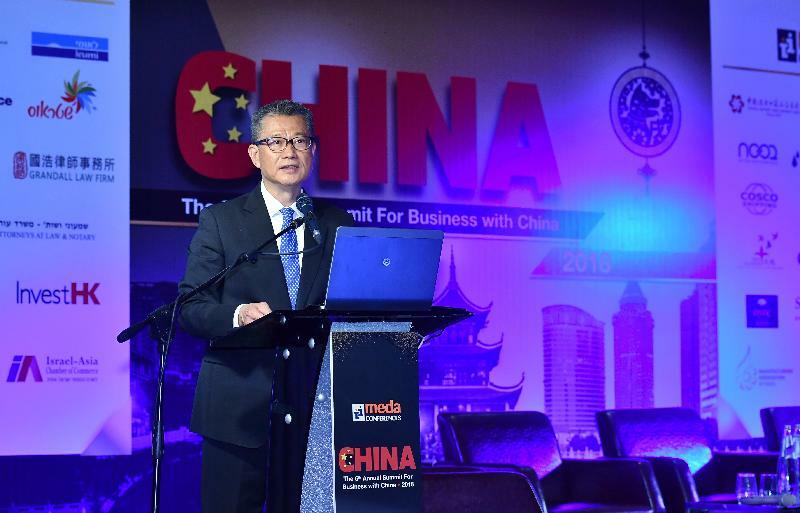 Following is the speech by the Financial Secretary, Mr Paul Chan, at 6th Annual Summit for Business with China in Tel Aviv during his visit to Israel today (September 4, Israel time). Good morning. Shalom! It is my great pleasure to be here in the beautiful city of Tel Aviv. First and foremost, a warm welcome to you all to the Annual China Business Summit in Israel. This is the sixth edition of the Summit, surely a testimony to its success in forging closer ties between China and Israel. We are all here today to explore fresh opportunities for collaboration – and with this year's Summit focusing on the Belt and Road Initiative, I can assure you that the prospects for closer collaboration are extremely bright, just like today's weather. Indeed, promoting cross-border connectivity goes to the heart of the Belt and Road Initiative. A modern-day version of the ancient Silk Road, the Initiative provides 21st century solutions aiming at optimising the efficient use of resources, promoting infrastructure development and streamlining flows of capital, talent and creativity, through mutually beneficial collaboration. The ultimate goal is achieving inclusive growth and prosperity, on the foundation of mutual respect and friendship. Covering more than 60 countries from Asia, Africa to Europe, the Belt and Road offers outsized opportunities. As the pivotal gateway connecting China and the world, and as an international financial, transportation and trade centre, Hong Kong has much to offer for businesses around the world to capitalise on the massive potential of this game-changing Initiative. A key aspect of the Belt and Road Initiative is infrastructure development. It is also a timely topic for Israel and Hong Kong. We know that advanced world-class infrastructure is key to expanding capacity for growth in economies, such as ours, where land supply is a limited and precious resource. In Hong Kong, two major projects are poised to begin operating in the coming weeks, forging new corridors for business expansion. I am referring to the Guangzhou-Shenzhen-Hong Kong Express Rail Link and the Hong Kong-Zhuhai-Macao Bridge. The Express Rail Link will connect Hong Kong to China's nationwide high-speed rail network and significantly reduce travel time between Hong Kong and the most dynamic cities in the Mainland, from nearby Shenzhen to further afield Beijing and Shanghai. On the other hand, the Hong Kong-Zhuhai-Macao Bridge, spanning over 45 km, will be the world's longest sea-crossing bridge-tunnel, boosting Hong Kong's connectivity with the fast-developing Pearl River Delta region. On top of land-based infrastructure, we are expanding the Hong Kong International Airport, the world's busiest cargo hub for eight consecutive years and the third-busiest international passenger airport. We are constructing a new runway system which will allow us to handle 100 million passengers and over 9 million tonnes of cargo a year. All these infrastructures indeed tell you something very special about Hong Kong - that is our determination to connect with the world and always look for opportunities to collaborate with others. Hong Kong is a staunch supporter of free trade and we thrive on the free flow of information, capital and talent. In fact, for 24 years in a row, we are named the world's freest economy by the US-based Heritage Foundation. International community is familiar with our friendly business environment, our fine tradition of the rule of law, our common law legal system and our highly competitive tax regime. English is also one of the official languages of Hong Kong. All these have enabled us to develop into a leading financial and commercial centre globally. And with all these strengths, Hong Kong is strategically positioned to serve as multiple service platforms for Belt and Road, and for Israeli businesses and entrepreneurs. First, Hong Kong can be the platform for capital formation and funding. Hong Kong's strengths and expertise in financial services need no introduction. Our deep liquidity, premier financial infrastructure and comprehensive options for raising capital can meet the financing needs of any mega Belt and Road infrastructure project. In terms of IPOs, Hong Kong has been ranked number one globally for five years in the past nine years. Hong Kong is also the global offshore Renminbi (RMB) business hub with the world's largest offshore pool of RMB funds. In order to enhance our competitiveness, we have recently launched a new listing regime that permits the listing of pre-revenue biotech issuers as well as companies from emerging and innovative sectors with weighted voting right structures. I am sure that will interest many of you here today and my colleagues from InvestHK will be more than happy to provide more information to you. To allow Hong Kong to play a more active role in promoting infrastructure financing along the Belt and Road, we have established the Infrastructure Financing Facilitation Office, or IFFO, under the Hong Kong Monetary Authority (HKMA). To date, IFFO has attracted 90 partners from around the world, including multilateral banks, financiers, pension funds, insurance companies, infrastructure developers and operators, as well as professional services firms, to work together to facilitate collaboration on infrastructure financing and investments. Separately, the HKMA has signed an agreement with the International Financial Corporation, a member of the World Bank Group, committing US$1 billion to fund infrastructure projects. This is a demonstration of our commitment in funding infrastructure projects. In April last year, our Securities and Futures Commission issued a statement setting out factors relating to the listing of infrastructure project companies on the Stock Exchange of Hong Kong. This provides a clear pathway for these project companies looking to Hong Kong for equity and debt financing. With a number of mutual market access arrangements between the Mainland and Hong Kong launched in the past few years, including the Bond Connect, the Stock Connect Schemes and the mutual recognition of funds, Hong Kong has become the prime gateway for overseas investors to enter the Mainland financial markets, and for Mainland investors to allocate their assets overseas. So when you do business with Hong Kong, you do business with China. Secondly, Hong Kong can be the platform for high-end professional services. Our world-class professionals in engineering, architecture, surveying, urban planning and consulting have the experience and knowledge to lead different kinds of infrastructure projects along the Belt and Road, in ascertaining project feasibility, in implementing the project and operating the infrastructure. We know very well that legal, regulatory and policy risks can undermine the feasibility of a project, and that risks in construction and cost-overruns will negatively impact a project's profitability. Hong Kong's deep pool of multicultural talent in law, accounting and finance can help manage these risks, by conducting legal due diligence, structuring the best deal through a combination of financial engineering as well as insurance and reinsurance and other tools. By finding ways to de-risk these projects, we make them more investment-worthy, more bankable. What's more, Hong Kong is the perfect hub for Belt and Road legal matters and for resolving business disputes. Under the unique "one country, two systems" arrangement, Hong Kong remains a common law jurisdiction. The international community is familiar with Hong Kong's common law system, underpinned by an independent judiciary as well as a very robust intellectual property protection regime. Arbitration awards made in Hong Kong are enforceable in over 150 jurisdictions including the Mainland of China. Thirdly, Hong Kong is the platform for you to find the right partners, no matter it is an equity partner, or a partner for the operation and management of infrastructure. As a matter of fact, Hong Kong enterprises are already participating in many of these projects, including airports, ports, power plants as well as metro system. Finally, Hong Kong can be the platform for enterprises to base their offshore operations. Companies expanding in the economies along the Belt and Road will be exposed to currencies and interest-rate fluctuations. Hong Kong is an ideal choice for setting up a corporate treasury centre, for centralising a corporation's financing and liquidity management in the region. We provide tax concessions for corporate treasury centres, whose qualifying profits will be taxed at only 8.25 per cent. As the same time, we will continue to expand our network of free trade agreements, trade promotion and protection agreements, as well as double taxation agreements, in order to better enable regional headquarters and treasury centres to be set up in Hong Kong to leverage the extraordinary opportunities in the emerging markets along the Belt and Road. In short, I invite Israeli companies to look into ways how Hong Kong's superb financial and professional services can help them realise bigger projects and bigger businesses in Asia and along the Belt and Road. Ladies and Gentlemen, I have mentioned just a few of the areas of great potential for closer partnership. No doubt, this Annual China Business Summit will discuss many more such opportunities. And for more Belt and Road insights, I encourage you to visit Hong Kong to join our next Belt and Road Summit in September next year. This year's Belt and Road Summit, held in June under the theme of "Collaborate for Success", drew nearly 5 000 participants, including ministerial officials, business leaders and professionals from 55 countries and regions. Apart from policy updates and experience sharing, we have also arranged business matching sessions. For those of you wishing to connect with Belt and Road opportunities, be sure to mark your diaries to attend the Summit in Hong Kong next September. Once again, thank you all for being here today. I wish you all a very fruitful China Business Summit, and I look forward to seeing you and your companies in Hong Kong very soon.